Discussion in 'GBAtemp & Scene News' started by Minox, Feb 22, 2009. The Supercard Team has released a new OS for the Supercard DS One. This update is mainly aimed at improving the RTS even more, but also fixes bugs that were present in a couple of games. I've used Ysmenu on my Supercard DS-One for a while. I find its cheat system the REAL deciding point. SC cheats are awful. I love the cheats system on the scS1, whats wrong with them in your opinion then? I like them too and with multi-boot you can have 3 cheat systems at your beck and call. Anyway the new option is to break Nins new protection system automatically, it works out the code on the fly (it's beta atm though, and only working for ML3 so far)... there's a longer boot up time with this option. Watch out for a bad ndsinfo.dat if you use one with this release, I hear it forces a few games to use the wrong save file type.. don't know if SC fixed yet it but JMR's (scdev.org) latest ndsinfo.dat fixes the issues if you get them. I hate that you have to have a single cheat file for EVERY GAME. I also hate it because if a new game comes out that does not work due to a piracy block, I have to wait for not only a cheat file, which always comes way after the official database, but also a new game data file so the Supercard can recognize the game id and USE the cheat file. And then there's the cheats have to be applied every time at game boot and not on the SC menu like other cards. And the cheats don't save. Thanks to a text limit, it's also difficult to see what some cheats are about. I did see what Rasputin said though, and I'm not sure I believe SC can do this. If a card could break the protection automatically, wouldn't this be a big deal? I'm not sure I believe they really implemented such a thing. Not that easy. We'll see how well it works when DQ9 comes out. I DID like the fact that you can change cheats on the fly, but they usually don't work well for me and often crash or freeze the games. I DO appreciate the fact that you can also boot Ysmenu and TTDS, but I doubt Supercard wanted to do this and wouldn't condone it. just a tip to improve RTS.. In final fantasy 4 when I was loading RTS the game would often crash. I think it was because the RTS save was not good. try PAUSING the game before saving an RTS ! If you try to save when there is an high activity in your DS ram you have more chance of making crashing your DS while you load an RTS since an RTS is probably just a snap shot your your ram. I have to wait for not only a cheat file, which always comes way after the official database, but also a new game data file so the Supercard can recognize the game id and USE the cheat file. I don't mean to be rude, but these are all problems that you can fix yourself. you can make you own cheat file extremely easily with the exes from SC's website. You can also put your newly made scc files in the same folder as the rom, with a matching filename, and they'll work, no matter what's in your ndsinfo.dat. Don't be lazy, especially if your problems can be solved with a few clicks. I never used the Triple/Quadruple boot loader. Tried it couple times, and the fact that I can't boot directly into the SuperCard Menu meant bye bye triple boot loader. Of course, I'm noob so there's probably a way to get it boot into the SuperCard Menu directly. Yes there is, it's called the default setup lol, dunno how you set yours up. 1. 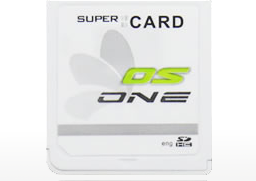 Install original supercard dsone shell into your sd card. 2. Install YSMENU or TTMENU into your sd card. if you want to make a primary shell as supercard shell, rename to SCDSONE.NDS. if you want to make a primary shell as dstt shell, rename to SC-DSONE.NDS. 4. Copy MSFORSC.NDS into your root of sd card. Y-Key pressing: booting with ysmenu.nds"
Dude, that is the cutest most awesome avatar I've ever seen! Cats are too friggin sweet! I know full well how to do that, and I've frequently made my own cheat dats when a new piracy cheat comes out, but it still doesn't make the thing any less clunky. I'm just citing one problem in MANY problems. Their cheat system has one good thing going for it: real time. As for the actual menu, I use Ysmenu or TTDS because I suffer from the common PSRAM error. It's a really game breaking problem that causes games to freeze all the time or not load. SC team also won't fix this, despite the fact that Ysmenu and TTDS work perfectly. They don't use the glitchy and broken PSRAM system, and write the save files directly to the card. Great, been wanting another update. Need to add this and the massive cheat file to my SCDS1 soon. Too bad I stopped using the SuperCard Menu long ago .